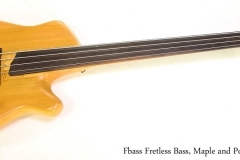 Here’s something reaching back a bit – an unusually shaped F Bass Fretless bass, built during 1982 by George Furlanetto in Hamilton, Ontario. 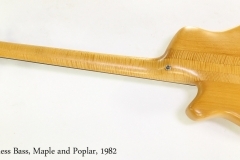 Hi-A Pickups were made named before Bill Bartolini started putting his own name on the cover, from 1973 until the mid 1980s, and were intended to accurately reproduce the sound of the guitar rather than provide a hot, overdriven signal. These pickups rapidly gained significant respect in the bass playing community, and are still very popular. Bill Bartolini retired in 2014 and sold the business to Clyde Clark, who had been consulting for manufacturing and design. Clark opened a larger plant in San Luis Obispo to meet growing demand. George Furlanetto has been building F Bass fretless and fretted models since 1978 in Hamilton, Ontario. A bass player himself, Furlanetto works with a number of prominent bass players including Alain Caron, Anthony Wellington, Bobby Vega and Saya Gray.